Lost and Found is the story of a mother and daughter struggling to mend a relationship torn by deceit and mistrust—in front of millions of TV viewers. The story begins at the sixth challenge for a reality television show much like The Amazing Race, where contestants are given riddles that are hints for the next international challenge. Cassie, a seventeen-year-old recent high school graduate, is fleeing from issues in her personal life that go far beyond typical adolescent angst; while she was trying to convince herself that she was not in love with her best friend, Mia, she was impregnated by her oft-ignored boyfriend. To make matters worse, her mom, flush with the success of recent weight loss and a new middle-aged love affair, never noticed Cassie’s pregnancy. Now, months after the baby’s adoption, Laura hopes that the show will bring them closer together, but her overzealous (and belated) attempts at reconciliation only serve to push Cassie further away. The colorful cast of characters surrounding the mother and daughter have their own problems to deal with. Betsy and Jason were high school sweethearts reunited after twenty years… and they are remembering now all of the reasons why the relationship didn’t last past graduation. Justin and Abby, two born-again Christians, joined the show to spread their message to the world that the “disease” of homosexuality can be cured. Hooked on Jesus, worked for them—or did it? Carl and Jeff, two prankster brothers, seem normal enough, but beneath their jocular surface they want desperately to win the million-dollar prize to provide Carl’s son with life-saving medical care. Former child stars Juliet and Dallas are the most straightforward, if spoiled, characters. Juliet is determined to jump-start her career any way possible, while Dallas just wants to have a good time. And Barbara Fox, the show’s icy hostess, believes that the contestants’ secrets will be the magical ingredient that vaults Lost and Found—and Barbara herself—to fame. But how far will she go to expose those secrets to the world? The story is told in bits and pieces from each character’s point of view. We pick up with them in Egypt and travel through Japan, Sweden, England, Ireland, and the United States. Along the way, they solve riddles and find strange items in this international scavenger hunt that could only be cooked up in Hollywood. Will the contestants give us the stories we want them to give us? Everyone’s here for a reason. The producers cast for conflict . . . but they also cast for story. They look for questions that the audience will want answered. Can you change your sexual orientation? What happens to child stars after they grow up? Wouldn’t we all be better off if we tracked down our first loves? The true story, however, is the gradual unfolding of the characters’ lives—the peeks through the curtained windows, the chinks in the armor. Discovering the true characters behind the walls they have erected is perhaps the most enjoyable part of the novel. For so long, it was just my secret. It burned inside me, and I felt like I was carrying something important, something that made me who I was and made me different from everybody else. I took it with me everywhere, and there was never a moment when I wasn’t aware of it. Here is the strange fact of my life as I have come to live it: I feel, at every moment, two completely different kinds of shame. Shame for being the woman I was, and shame for leaving her behind. The dichotomy between her thoughts and actions adds an intense feeling of conflict to her narrative and to the narratives of those also struggling with secret identities, a common theme of the book. 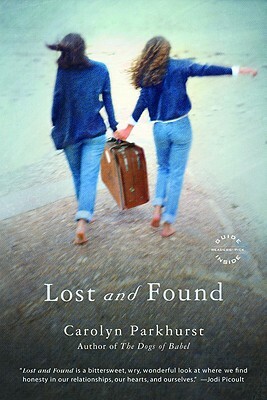 Lost and Found is a well-written novel of secrets and yearning, of self-knowledge and self-acceptance, that is simultaneously thought-provoking and entertaining. Perhaps Barbara Fox is right—who doesn’t love to watch secrets unfold? Carolyn Parkhurst is the author of The Dogs of Babel and the upcoming The Nobodies Album. She received a B.A. from Wesleyan University and an M.F.A. in Creative Writing from American University, and she lives in Washington, D.C., with her husband and two children. This review was great and it definitely makes me want to read the book. I think, to an extent, all readers are voyeurs who “love to watch secrets unfold.” 🙂 Anyway, thanks for reading, reviewing and sharing!